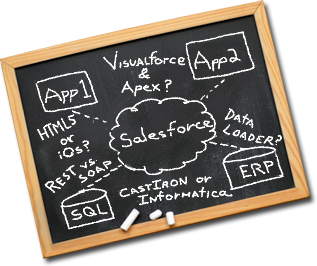 Your team has been tasked with integrating your systems with Salesforce. Your developers have taken the DEV courses but need more specific guidance to move forward. That’s the bad news. The good news? We're an authorized salesforce.com training delivery partner with a growing team of senior certified salesforce.com instructors regularly delivering the official Admin and Developer curriculum in public and private workshops in the US and around the world. We deliver one-on-one technical mentoring, guidance and consulting for individual developers or full-size teams, and leave them secure in their new knowledge after we're gone. We can help you assess whether or not the Force.com platform is an appropriate solution for your requirements, and identify best practice architectural approaches if it is. We deliver mentoring and guidance designed for developers by developers. You tell us what you need, and we'll assemble and deliver it effectively to your team. Copyright 2011 - 2019 Forcementor.com All rights reserved.